Why you should be cautious of investing in expensive stocks? When the Round of 16-match between Spain and Russia started on July 1, Spain were the clear favourites. The reasons were not far to seek. Spain came with a formidable reputation. When the Round of 16-match between Spain and Russia started on July 1, Spain were the clear favourites. The reasons were not far to seek. Spain came with a formidable reputation. This was the team that won the Euro Cup 2008, FIFA 2010 and Euro Cup 2012. Russia had shown promise but hardly looked like they could overpower the Spaniards. But Spain should have been cautious. The FIFA 2018 has already had its share of giant killers. Italy and Netherlands failed to qualify for FIFA 2018, German did not get past the first round and Portugal and Argentina were eliminated in their first match in the knockout stage. In fact, Spain went wrong in five key areas and each of these mistakes has some important lessons for investors. That was something Spain had in abundance. With two Euro Cup victories and one FIFA under their belt in the last 10 years, they started out as clear favourites in the clash against Russia. Spain almost believed that their star status will help them to sail through to the quarter finals. That was almost apparent in their style of play. Spain, perhaps, forgot that their short passes approach was a means to an end and not an end by itself. Only midway through the game did Spain realize that they were just not doing enough, by which time Russia had virtually tightened the defence. This is so normal when we buy expensive stocks just because of pedigree. Not only are we stuck with under-performing stocks but in the process we also miss out on the exciting opportunities along the say. The key to investing lies in focusing on tomorrow rather than on yesterday. Igor Akinfeev is probably the most popular man in Russia today after Vladimir Putin. If Spain had watched the league matches closely they would have realized that the biggest strength of the Russian team was its defence and impeccable goal keeping. Ideally, Spain must never have allowed the game to go into penalty shootouts because they were starting off with a massive disadvantage. In instant football, the less fancied teams are always at an advantage. When we invest, we all tend to ignore this Igor Akinfeev effect. We are so obsessed with the established and expensive large cap names that most of the incredible mid-cap stories just slip by us. An investor must not allow this Igor Akinfeev effect to take over your investment decisions. The Spanish soccer game is built on short passes (Tiki Taka in Spanish). If you watched their game, it was extremely delectable and refined but they made a basic mistake. Through the 120 minutes of the game, their movement was more sideways than trying to push forward. By the time Spain actually starting pushing hard, it was too late because Russia had tightened its defences. To push portfolio performance ahead, you cannot do with just the expensive stars of yester years. Eicher and Infosys are great stocks but they have really gone nowhere in the last few years. You need stocks that can push your portfolio forward and not just keep dribbling sideways. That is why you must be cautious of expensively priced stocks. Ok. We are back to Igor Akinfeev. What was so unique about the goal that Akinfeev saved for Russia? Apart from agility and reflexes it showed a ready mind that was willing to innovate. In the shootouts, goalkeepers estimate the direction of the kick and take a leap. If it goes the other way, you just leave it. 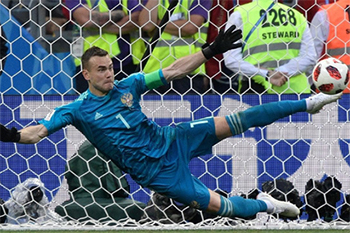 Akinfeev combined athleticism and innovative thinking to save the goal despite getting the estimate of his dive wrong. That was totally lacking in the Spanish game both before and during the penalty shootouts. That is relevant to your portfolio too. You normally start off with a certain approach, but your skill lies in making appropriate changes to your strategy. Spain just played their tradition game. It looked great but achieved nothing. If you looked at the ball possession ratio, Spain was vastly superior to Russia. In fact, Spain had the ball with them most of the time. But they made little effort to really push Russia to a corner. In fact, Spain’s casual approach allowed Russia to equal with a penalty. When it comes to your portfolio, it is not just about buying pedigreed stocks and sitting tight. It is a lot more about making the best of the opportunities that present. An underpriced large cap, a fast-growing mid cap are all opportunities to be capitalized on. So much for the Igor Akinfeev effect!